Craig Redman says that his never sick of seeing every day on his way to the studio the design of ‘I Love NY’.He thinks that the cool thing about this tees are the millions of illegal color variations. 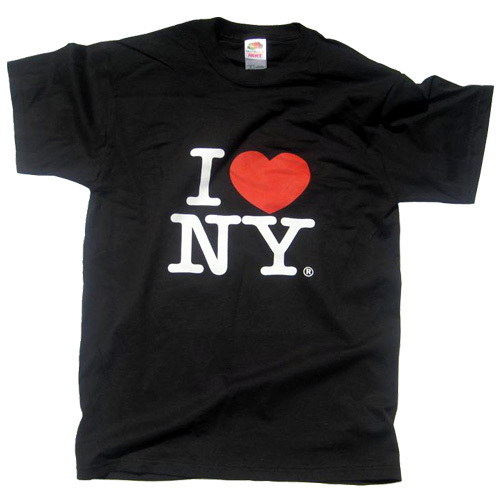 The I Love New York logo is a rebus created by Milton Glaser.The logo has become a part of the American pop cultural canon, since inspiring countless knock-offs (t-shirts, bumper stickers, etc.) of the “I …” form. New York, in turn, has tried to uphold its trademark by filing a total of nearly 3,000 trademark objections against imitators . Evanimal opinion is that nothing can kill the charm of D.A.R.E shirts. He just loves the irony of the messages. Victor Ortiz just loves the iconic t-shirt graphics but one of the most is the smiley face never looks old fashion. Cameron McEwan just loves the classic “communist party” by Tom Burns.He likes the political messages but this one in particular because the message is about having a good time. Derrick Castle loves the Che Guevvara iconic t-shirts .It’s often used as a message for rebellion. Antoine Hester he thinks that the most iconic t-shirt is that one with the Obama design that produced and entire collection of figures with red and blue iconic shirts. Rob Gold thinks that Rolling Stones lips and tongue are just sensual and timeless. you are really a excellent webmaster. The web site loading velocity is amazing. It seems that you’re doing any distinctive trick. Moreover, The contents are masterpiece. you’ve performed a great job in this matter! Hello my family member! I wish to say that this post is awesome, nice written and come with almost all vital infos. I’d like to look more posts like this .